Product prices and availability are accurate as of 2019-04-02 04:29:17 EDT and are subject to change. Any price and availability information displayed on http://www.amazon.com/ at the time of purchase will apply to the purchase of this product. Delivering crystal clear sound and network capability, the Marantz NR1603 7.1 Home Theater Receiver offers powerful performance in a Slim Line design. 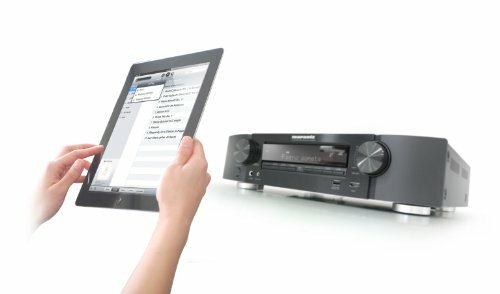 The receiver's comprehensive features include easy on-screen setup, an Ethernet port, six HDMI inputs including 1 on the front which can be used to connect mobile devices such as a camcorder or tablet, allowing you to immediately enjoy videos, photos and music and playback of the latest hi-definition audio formats. AirPlay allows you to stream music wirelessly from your iPhone, iPod Touch and iPad over your home network. The NR1603's advanced technology provides cutting-edge performance for all your movies and music. Fully discrete power amplifiers for all 7 Channels (50 W x 7 Channel, 8ohm 20-20kHz 0.08%) 3D pass-through technology Enjoy 3D video entertainment with dynamic surround sound. 6 x HDMI in/1 x HDMI out Lets you connect your HDMI-equipped devices with a single cable. Enjoy high definition audio and video. 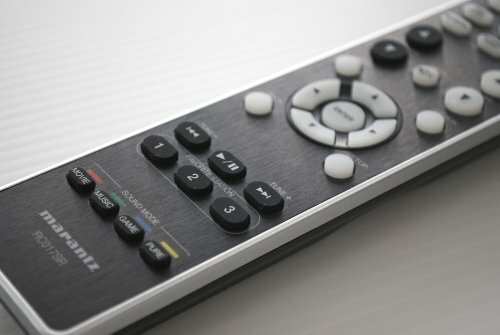 Front Panel HDMI Input Provides an easy connection for quick hook-up and playback of your HDMI-equipped portable devices. Front Panel USB Input Direct digital play for your iPod, iPhone and USB drives.